If you're planning to buy your first sailboat or even a different type of boat, don't ask how much it will cost. Instead, ask how much it's going to cost you. Although you can easily answer the first question by checking price tags, you'll probably have no idea know how much it's going to cost you until it's too late. A friend of mine bought a 39-foot sailboat in the year 2000. It was an unfinished, overbuilt go-anywhere cruiser. In 2002, after having blown his budget, it was ready for the Atlantic crossing but still unfinished, quite rudimentary and naked: no roller furling, no self-tailing winches, no fridge, no radar, no dodger...well, not much of anything. The price tag, however, had reached €100,000. During the 13 years since the Atlantic crossing, he has spent €66,000 euros on boat operating costs and a few minor upgrades, but the boat is still naked and now even a bit scuffed. So, he wasted spent €116,000 in 13 years, which is equivalent to €9,000 per year, not including his labor. Ouch! I didn't know he was so rich, you'd never guess it by the car he drives, the clothes he wears or the restaurants he eats at...to think of it, he rarely goes to restaurants. What a cheapo! 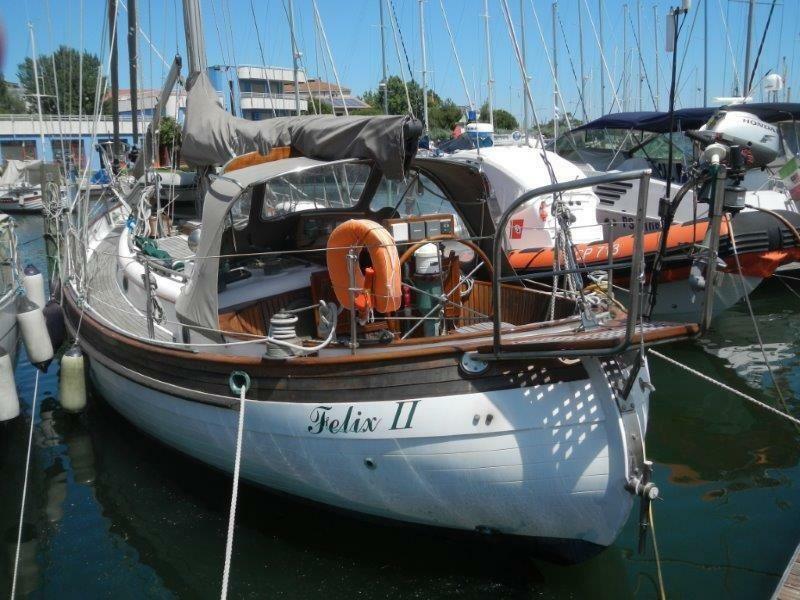 I have another friend who, coincidentally, 13 years ago purchased a roomy second-hand 26-foot well equipped production boat in great shape for €35,000. He spends about €2,000 per year to run it and does very little work other than keeping it shiny and clean. This owner spent €41,000 in 13 years, which is equivalent to €3,150 per year. That's a staggering difference between the two scenarios. Additionally, we could also say that owner 2, not only spent nearly a third less money, but also enjoyed his boat twice as much. Therefore 3 x 2 = 6 times better investment. Also remember that these two owners keep their boats at the same marina and use them for nearly identical purposes: 1 month of coastal cruising to the Algarve in summer and day sailing in between. In reality, owner 1 did very little day sailing because he was too busy doing boat work and also because of the hassle of spontaneously taking out a bigger boat for an afternoon sail. Admittedly, owner 1 crossed the Atlantic, whereas owner 2 would never dare do so in his smaller production boat. Please, keep in mind that these are facts, based on people I know very well, and not mere theory. I'm aware that every boat is unique and every owner is also unique, which can greatly alter the equation. But I know a lot of boat owners, and I could make many other comparisons with similar results. Also note that these observations apply to local sailing and occasional coastal cruising, not to bluewater cruising or living aboard full-time. That's a completely different gig. With this in mind, I have come to a few conclusions about boat ownership based on real life experiences - mine and of people I know well. Never build a sailboat unless it's small or you don't like sailing anyway. The resale value of your work of art will be a tiny fraction of what you spent - if you actually finish it. I've seen enough boat-building tragedies to make me want to cry and one, in particular, that would make the very devil cringe. Owning a sailboat is a horrible financial investment. Borrowing money to pay for a boat is like borrowing 100-dollar bills to light cigars with. New is good for buyers looking for ways to spend their cash. That's what money is for, right? New is peace of mind. You can wear white pants aboard, go sailing or sip drinks in the cockpit looking sophisticated instead of sweating down below like a grease-monkey boat slave. If you buy a smallish new production boat, say 30 feet, it will depreciate at least 5,000 euros per year over a 10-year period. If you buy a new 50-foot production sailboat, it will depreciate around 12,000 euros per year during the same 10-year period, not to mention the exorbitant cost of maintaining it. 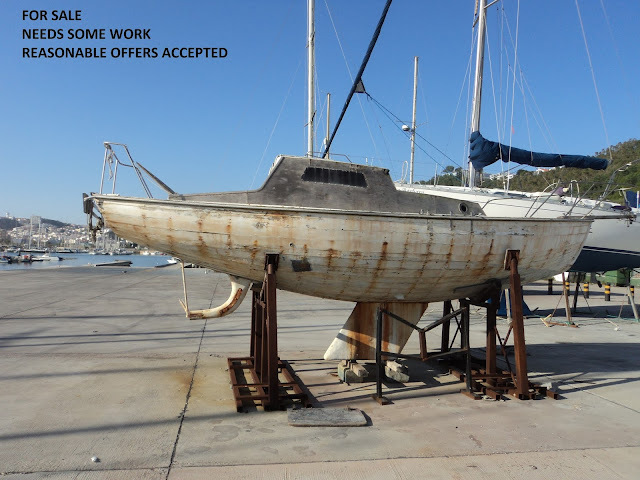 After 10 years, boat depreciation begins to diminish if the boat is kept in reasonable condition...but the cost to maintain it will begin to increase slightly. A 10-year-old boat may have a neglect or abused engine, it may have been run aground on a rock or had holes drilled into the deck without proper sealing. Other than that, what you see is pretty much what you get. An older boat may look incredibly pristine and boast a good engine while concealing, pitted chainplates, mushy deck or hull coring, unreachable rot in interior woodwork, a corroding rudder post or fatigued rudder frame, messy wiring, questionable mast fittings, etc. In the first 10 years sailboats depreciate at about 5% per year. A 10-year-old boat will give you the biggest bang for your buck. And you don't need to be a genius to do your own survey. If it "looks good" and the engine doesn't cough up black or blue smoke or overheat, you're in business. I believe that surveys are more important for older or larger boats. Nevertheless, if this is your first boat, hiring a surveyor may be a good idea. You can get real boat bargains here, especially in well maintained boats reaching the 30-year mark. Within this time frame sailboats will most likely require upgrades, especially new sails, dodger and sail cover canvas, electronics, etc. Some have been partially or fully upgraded, some have all the original equipment. You have to do your math. Make a list of what it needs, calculate the extra cost and labor and then compare the final price to a similar boat in better condition. It may have a questionable engine, a scuffed interior, a suspicious rudder, beer-belly sails, toothy anchor chain attached to an ancient plow anchor, the dreaded mushy deck core, a toilet that squirts back at you. It may also be in pristine condition, for a price of course. These boats may be cheap but not dirt cheap. Do the math. If you buy a sailboat that's falling apart, remember this: an old sailboat hull is not worth very much. For example, if you buy an old hull but you need to repair/upgrade most of the basic equipment and start tearing out and rebuilding some/all of the interior, the final cost will be higher than buying a similar-size boat that's ten years old. "But I'll have a new engine, new sails, new winches, ...." you may argue, "It'll be like a new boat!" To which I reply, "a 10-year-old boat is almost new and you can start sailing the next day instead of spending all your free time researching and working for the next 4 years, with the added risk of not doing it properly, of ending up with an old-amateur-rebuild-looking boat. Derelict boats have many uses: if made of wood, it's great for firewood; if made of steel, you can sink it and create a fish haven; if made of fiberglass, you can paint it and place it in your backyard and make a playhouse for the kids or an interesting place to hang out and write blogs. The possibilities are endless. What sailboat would I buy now, if I din't already have one? Because I'm living in Europe, and because of the damn EC boat import rules, I'd have to buy an EC approved European boat. Simply put, I'd go for a 30-foot €40,000 production boat. Low maintenance, easy to handle as I get older, lots of life left in it, enough room for me and the occasional crew member/members, decent turn of speed and, most important, low operating costs. Let's imagine I traded my boat, Jakatar, for the aforementioned 30-foot €40,000 sailboat. What!!! Are you crazy? You wanna give your boat away? The cost of keeping Jakatar for the next 15 years will be about €4,500 x 15 = €67,500. The cost of keeping the said 30-foot boat for the next 15 years would be about €2,500 x 15 = €37,500. That's a difference of roughly €30,000 euros. If you look at it from another perspective, this means that, in reality, by saving €30,000 I would be receiving the equivalent of €70,000 for Jakatar. It also means that I could retire 2 years earlier, have more fun, less work and, perhaps most importantly, have a boat I can handle single-handed when I get older. Scary thought, I tell you. Not applicable to small boats, say, about 20 feet and under. These smaller boats usually have an outboard engine and very little equipment or interior furniture. There are many exceptions that will prove me wrong. But that's like saying "my grandfather was a heavy smoker and lived to be 94, so smoking isn't bad for your health." Not applicable to people who get a lot of satisfaction from restoring an older boat. Someone once told me he got way more pleasure from fixing than sailing. Can't argue with that, it's a perfectly legitimate pastime and probably far more prevalent than we think. I too enjoy many maintenance tasks on Jakatar, but up to a limit, after which it becomes a burden and no fun at all. "Choose your life's mate carefully. From this one decision will come 90 percent of all your happiness or misery. ~ H. Jackson Brown, Jr. I've wanted a sailboat since I was a teenager, and a boat like the Hans Christian 43 is what I lusted for. It has the capacity and looks to take you to exotic far-away places safely and in style. In fact, it's sad to see a Hans Christian floating idly at your local marina or mooring field begging to be sailed over the horizon. Then the French invented this!! It looks more like a motorboat or a fancy swimming pool deck. It's more likely to induce daydreams of parties and cocktails than the romantic urge to sail to Tahiti. "What's that? You don't want to sail to Tahiti, not even to Mexico. Really, are you sure? I must admit that I've never been aboard a Hans Christian, but I do own a Corbin 39 - a canoe-stern go anywhere sailboat that is a poor sailor's version of a Hans Christian, sort of. 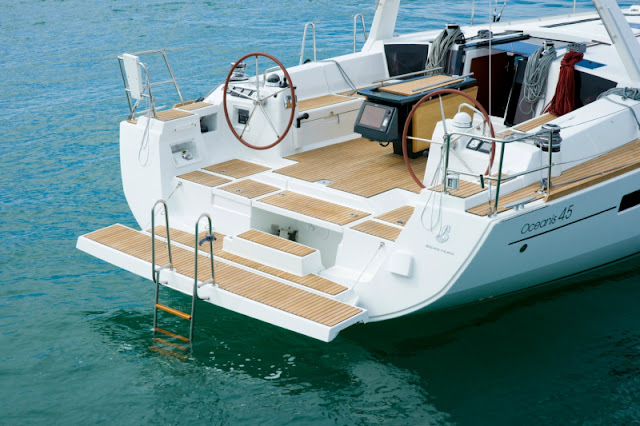 But I do have friends with boats similar to the Oceanis 45 shown above; some bigger, some smaller, with either sugar-scoop or fold-out transoms. I've been on their boats, both sailing and socializing, and I can tell you this: there's no comparison. Not only that, I've found that almost unfailingly they'll dinghy over to my boat or call to invite me to their boat and hardly ever come aboard mine. This includes Manuel on his Beneteau 26. Could it be I have no fridge and thus no cold beer? No, because I also have good wine. I've concluded that they've become spoiled by the ease of simply stepping aboard into a spacious cockpit and aren't too enthusiastic about climbing a ladder into a gopher hole. Charming, but a bit crowded for sundowners with friends. Forget dinner parties. The interiors and deck are basically a matter of taste. I personally prefer the Hans Christian's interior, it makes me feel like I'm in a real boat and not in a swanky apartment. Being at home may be more convenient, but not as much fun. That's why you bought a boat. 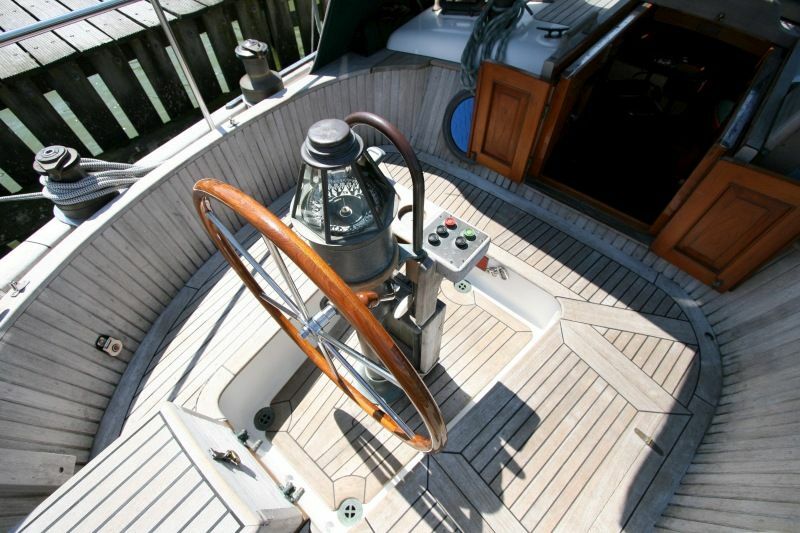 I truly believe that a sailboat's cockpit can really make a huge difference when living aboard and for coastal cruising. Some people may argue that almost all boats are safe for blue-water cruising, it's the crew that counts. There may be some truth to that, but if I were to cross the Atlantic again I'd do it in my Corbin. Even in a storm I always felt safe in that little cockpit. Besides, we never invited anybody aboard, never had dinner parties, didn't go shopping and never used the boarding ladder, thank God. I genuinely think I'd feel scared sailing in the cockpit of the Oceanis 45 shown above being thrown around in 25-foot waves. If you're crossing oceans, maybe it's not a bad idea to trade off a luxurious setup for a smaller, safer cockpit. Don't scratch the wrong itch. Sorry, gotta go. I can see a bunch of angry sailors running toward me wielding boat hooks. Glad you liked it. I have a feeling you can relate to some of the stuff I talked about from your own experience.